Sometimes the simplest design option is the best. The secret is to know when this is the case. 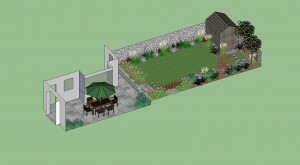 In this garden design, the garden was basically rectangular with a narrow section of the garden adjacent to an extension jutting out of the house. The existing garden had two positive aspects which had to be embraced and made into features in themself. The garden was surrounded by wonderful old stone walls, unfortunately some parts were not in great condition but still they were going to make a gorgeous back drop to the new garden. There was a slope upwards in the garden. A slope is always something I love to see as one often has to create height in a garden, whereas, when it already exists, you just have to exploit it and make it into a feature in its own right. A patio finished in kota blue limestone was created in the narrow section of the garden adjacent to the extension to the house. This was backed up by a low wall and steps leading to the rest of the garden. The patio was softened by corner beds filled with plants and the wall was made from narrow slithers of the patio slabs which gave a nice textural contrast to the paving slabs. The upper garden is basically rectangular in shape with borders of flowering plants around the sides nicely wrapping around the garden shed tucked into the corner. A small section of paving was positioned against the stone wall in the upper garden to provide space for a bench set to enjoy the sunshine. A path was required to the end of the garden, however, in order to ensure that this did not interfere with the lawn space itself stepping stones hugging the edge lead down the garden through the lawn to the rear gate and shed and provide a nice feature to finish this garden design.